One day, the bride and groom which I support had their wedding reception with their families and friends were been invited after having their wedding ceremony at Kamigamo Shrine. It was a wonderful space which couple’s caring and smile of their guests fill up the reception room. The bride was the eldest of 5 sisters. The reception room was decorated by flower arrangements and other goods for welcoming the guests which were all made by her sisters and mother which made the room brilliant. The words with great love of mother made my heart so warm. During the reception, when the groom performanced with the band, everybody demanded “enchore! !” and that made everybody turn to one, and it was a wonderful time with happiness filled the place. After the wedding reception ended, the suprise was waiting for them at front of the restaurant!! 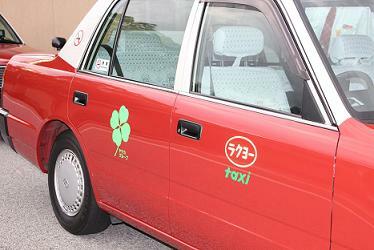 It is a taxi which has four-leaf-clover decorated. You could not ever call the taxi designately, so it was an unexpected chance. It may be the fate. I think it has came by to celebrate the couple by hearing the news from heaven. The groom who has sweared to all that he would protect bride’s smile forever. Please make a family with feeling a lot of happiness. Thank you for many smiles! !